I am a geomorphologist interested in quantifying modern and past rates of landscape evolution. 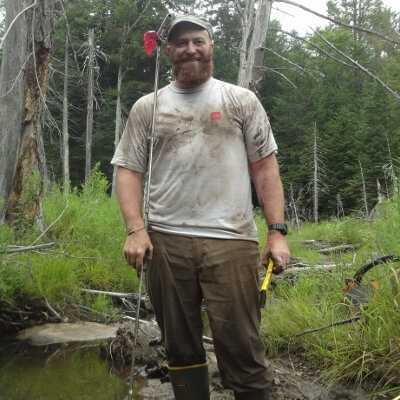 I employ modern field techniques in concert with topographic analyses, remote sensing, soil science, numerical models, and isotope geochemistry to investigate active surface processes and past surface processes preserved in the stratigraphic record. In particular, I am an expert in the application of cosmogenic nuclide (e.g., Be-10, Al-26, Ne-21) geochemistry for both geochronology and the quantification of millenial scale erosion rates. A primary motivation in quantifying the rates of surface processes over geologic time scales is to define background rates of landscape evolution driven by tectonics, climate, and internal sedimentary system dynamics for comparison to rates of surface processes driven by human-induced landscape change. Generally, my research synthesizes topographic analyses in GIS, surveying hillslopes/rivers in the field, and analyzing isotopes as tracers of surface process rates. In terms of isotopic tracers, my new lab at Denison will focus on using fallout radionuclides like Be-7, Cs-137, and Pb-210 to fingerprint sediment sources and quantify rates of sediment transport over decadal timescales. Jungers, M.C., and Heimsath, A.M., 2015, Post-tectonic landscape evolution of a coupled basin and range: Pinaleno Mountains and Safford Basin, southeastern Arizona: Geological Society of America Bulletin, v. 128, no. 3-4, p. 469-486. Jungers, M.C., Heimsath, A.M., Amundson, R., Balco, G., Shuster, D., and Chong, G., 2013, Active erosion-deposition cycles in the hyperarid Atacama Desert of Northern Chile: Earth and Planetary Science Letters, v. 371, p. 125-133. Jungers, M.C., Bierman, P.R., Matmon, A., Nichols, K., Larsen, J., and Finkel, R., 2009, Tracing hillslope sediment production and transport with in situ and meteoric Be-10: Journal of Geophysical Research-Earth Surface, v. 114, p. F04020. Cox, R., Bierman, P., Jungers, M.C., and Rakotondrazafy, A.F.M., 2009, Erosion Rates and Sediment Sources in Madagascar Inferred from Be-10 Analysis of Lavaka, Slope, and River Sediment: Journal of Geology, v. 117, no. 4, p. 363-376. Oerter, E., Amundson, R., Heimsath, A., Jungers, M., Chong, G., and Renne, P., 2016, Early to Middle Miocene climate in the Atacama Desert of Northern Chile: Palaeogeography Palaeoclimatology Palaeoecology, v. 441, p. 890-900.